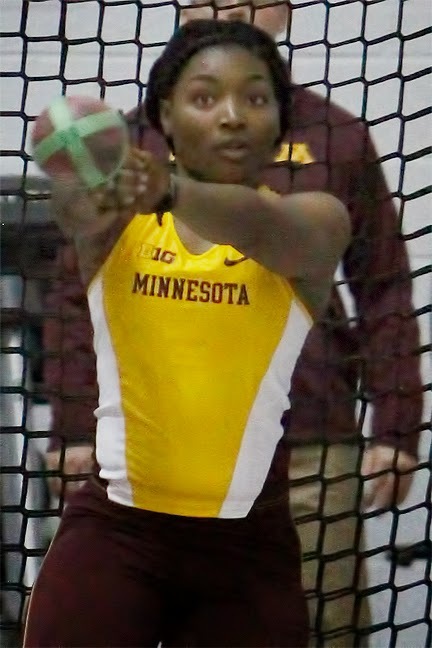 The first dual meet between the UW Badgers and Minnesota Gophers in 37 years provided a great opportunity for MTC Alumni throwers to hit some new lifetime bests early in the NCAA indoor season. 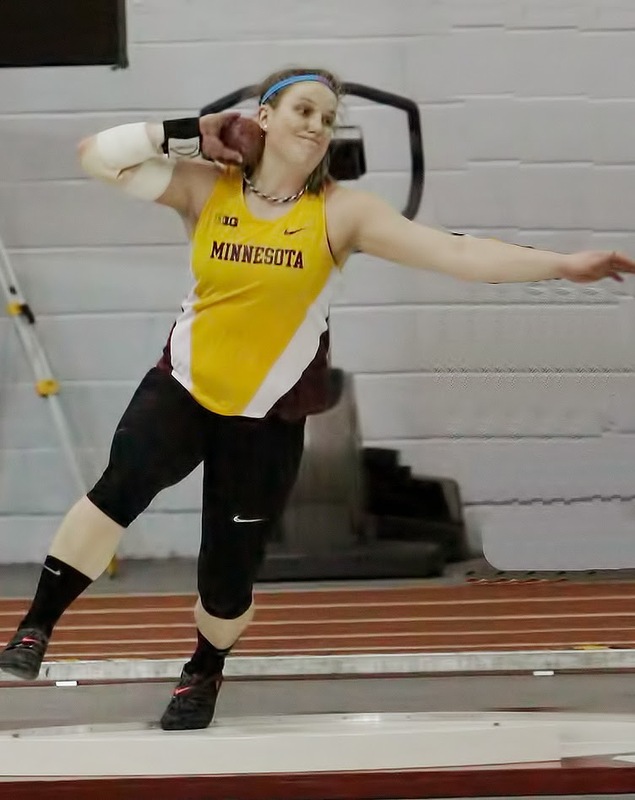 Kiley Sabin who is in her redshirt season in her first year at Minnesota p.r. 'd in the exhibition discus event 46.39m (152'1"). KeKeBurks, jr, Minnesota, also p.r. 'd in the discus with a throw of 50.04m (164'1"). 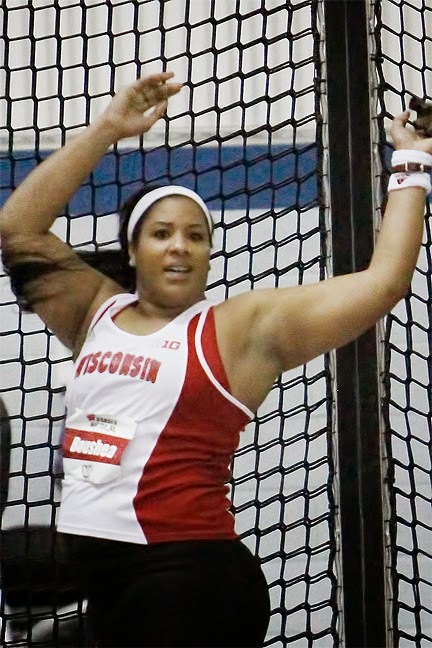 Angela Boushea, sr. Wisconsin, p.r. 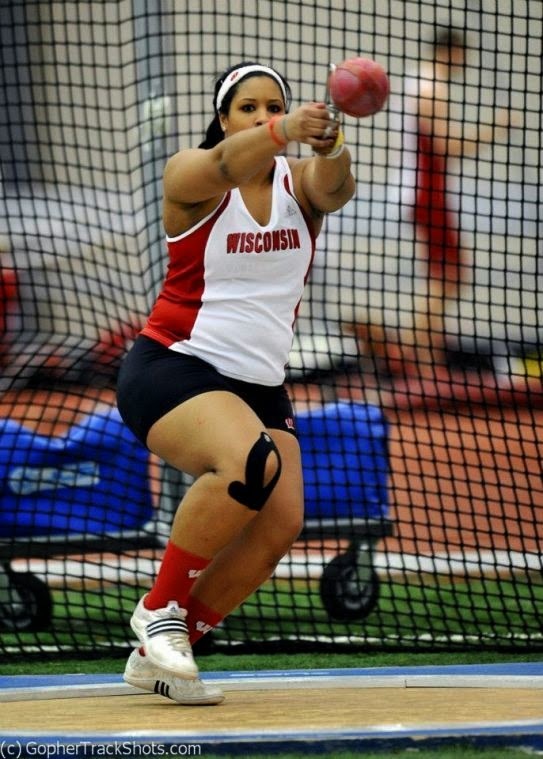 'd in the weight throw 20.06m (65'9.5') which is the 3rd best throw in the Big Ten this season and the 17th best throw in the country so far this season. Kailee Kamps, so. Minnesota, p.r. 'd in the shot put 15.03m (49'3.5"), an amazing throw after a lengthy rehab from a elbow injury. It was awesome to see the girls compete at such a high level! Best of luck and continued success this season. Special Thanks to Dave Figi for the in-action photos. Check out Dave's coverage of the meet HERE. USATF will be hosting the annual Indoor Youth meet at Carthage College on Feb. 8th. Meet INFO and PRINT REGISTRATION HERE. Watertown High School will be hosting a meet on Saturday March 7th. Field Events, including shot put begin at 10am, and will be done before our 2-4pm session that day. Just wanted to give a shout out to all of the MTC ALUMNI who begin their NCAA indoor seasons. Throw FAR, enjoy the journey, and keep working hard- there is lots of time to continue to improve before the meets that count! WIAA Boys State Discus Record - Luke Sullivan 193'3"
Luke Sullivan's record 193'3" discus throw at the 1993 WIAA STATE Track and Field Championships has stood the test of time. Its one of the oldest records in the books. State records can only be set at the WIAA state meet. Luke was a junior at Verona High School and despite winning his third state championship his senior year he couldn't top his own mark on the day of the meet, despite throwing 198'11" that season. We've seen a lot of good discus throwers since 1993, but none have been able to produce the magic Luke created in 1993. If records are made to be broken, it will take someone with a lot of hard-work, determination, great technique, and most importantly the guts to not succumb to the pressure state meet can produce. Until then, keep watching this video and stay hungry.